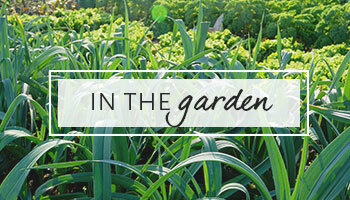 Looking for fruits, herbs, and vegetables that grow in shade? In this article, you’ll find a detailed list of EDIBLE, shade-loving annual, biennial, and perennial plants, and the seasons in which they perform best. If we could have a dollar for every time we’ve heard people say, “I don’t have a garden because my yard doesn’t get enough sun,” we’d have $47 in the bank. With that $47, we could buy more than enough edible garden plants that grow in shade to keep our fridge and pantry well-stocked with produce. If your yard gets part to full shade, then it is true that you can’t grow some common fruits and veggies, such as large tomatoes and peppers. However, there are countless plants that are acclimated to thrive in full to part shade, and many of them are choice edibles. What does full sun, part shade, and full shade mean? These sunlight level distinctions are important to keep in mind when planning your garden. Putting a plant into more sun or less sun than it requires for optimal results will result in… suboptimal results or even dead plants. It’s important for you to pay attention to how the sunlight levels change in your garden from season to season. For instance, we have areas of our garden back near our forest line that are part – full shade in the summer when the leaves on the trees are out. However, from mid-fall through early spring when the trees don’t have leaves, those same areas are in full sun. During those months, we grow loads of winter annual veggies under low tunnels to protect them from the cold. Young leafy greens in a spot that’s full sun in the cold months and part-full shade in the warm months due to tree leaves blocking the sun. Another interesting phenomenon to work with is “microclimates.” Microclimates are specific spots where the growing conditions (sunlight, heat, water) are different than the overall growing conditions in your area. It’s also important to note that a part-shade spot in the summer might get as much solar exposure as a full sun winter spot. For instance, we’ve successfully grown cool-weather plants like turnips and beets under the shade of rows of summer corn despite the intense summer heat in our South Carolina climate. The shade provided by the corn leaves kept the ground below much cooler, while the intense summer sun still provided enough light (even in shade) to allow the root crops to grow. biennial = plants that take two years to complete their life cycle (usually growth during year 1, then flower/seed/death in year 2). perennial = plants that lives for 2+ years. Understanding a plant’s life cycle is very important when determining its placement in your garden. For instance, we mentioned how we used our knowledge of microclimates to get good production out of ANNUAL plants like beets and turnips grown in the shade of corn during the summer months. A beautiful and colorful assortment of flowers and vegetables that grow in shade. This approach would likely not work well with PERENNIAL plants like a grape vine. If we put a grape vine in a spot that got full shade during the summer months, it might live for a while, but it wouldn’t thrive or synthesize enough energy from the sun to produce grapes. 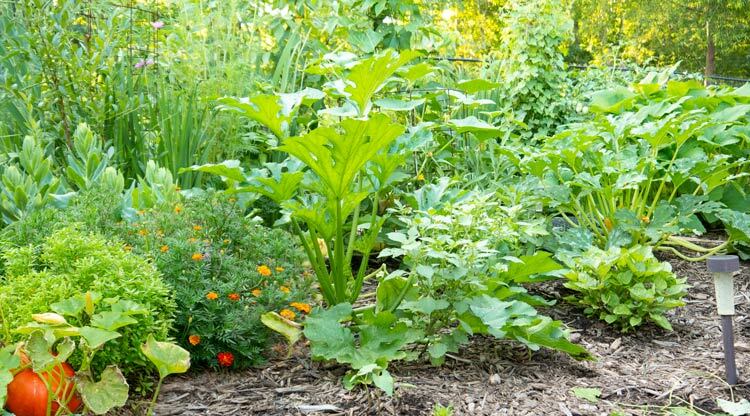 Below is a detailed list of fruits, herbs, and vegetables that grow in shade. We’ve grown the vast majority of the plants on this list (in part or full shade as noted), so we can attest to the fact that they don’t just eek out an existence when grown in shade, they actually perform quite well. Given the tens of thousands of species of edible plants that grow around the world, there are sure to be shade plants we’ve left off this list. If you see one we’ve missed, please let us know in the comments section and we’ll add it to the list and give you credit! Shade tolerance: Grows well as an understory tree in part shade, but will produce the most fruit with 6+ hours of sun. Tastes like: American persimmons taste like sweet, delicious caramel candy AFTER they’ve been sweetened by frost/cold weather and turned mushy-soft. Otherwise the fruit can have a very unpleasant puckery effect in your mouth. When to grow: Plant saplings in spring. On mature trees, fruit ripens and falls to the ground in fall. Nope, not blackberries. 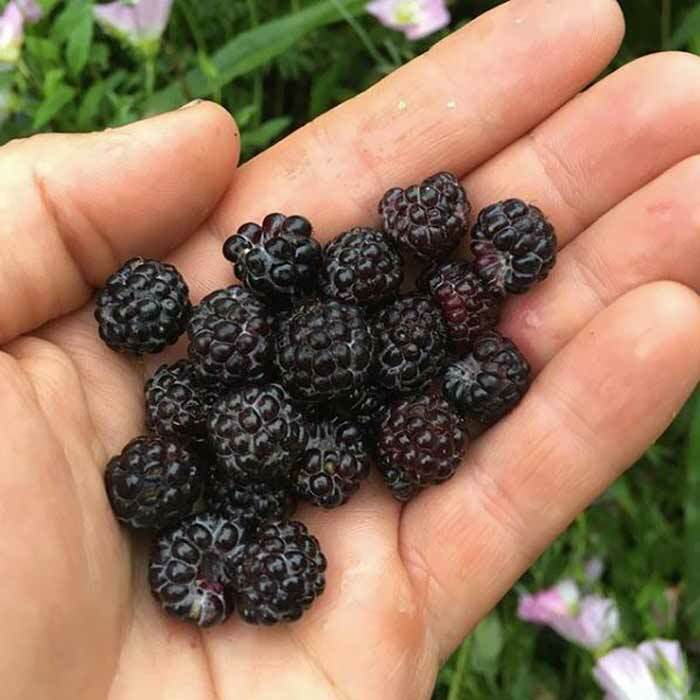 These are black raspberries, which have a very unique flavor that isn’t quite raspberry or blackberry. Black raspberries also grow in part shade. Shade tolerance: We’ve grown black raspberries in full sun and part shade. Our full sun plants probably produce a bit more fruit, but not by much. Tastes like: a cross between a red raspberry and a blackberry, but with unique notes – truly delicious! When to grow: Grow from starts in spring. Second year canes produce fruit. New canes emerge in spring, and three year old canes die and should be removed. Canes get tall, topple over, and set new roots where they touch the ground, spreading rapidly. 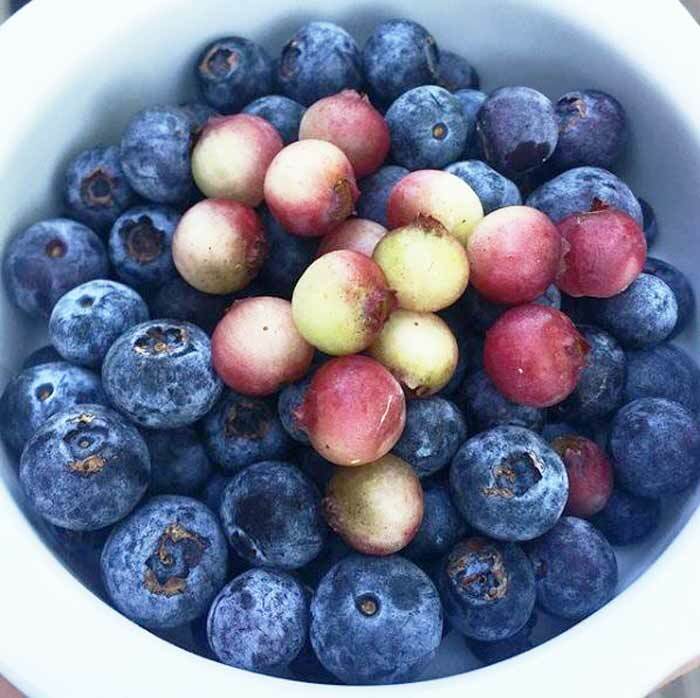 Summer wouldn’t be summer without blueberries. We grow multiple varieties. One of our faves is lemonade blueberries (the light-colored ones on top). Shade tolerance: Some of the varieties of wild, native blueberries with small fruit that we forage only grow in part to full shade. Domesticated highbush and lowbush blueberry varieties will tolerate part shade, even if they don’t produce as much fruit as plants grown in full sun. When to grow: Put young plants in the ground in the spring or fall. We’re just on the outer range of being able to successfully grow currants and gooseberries since it’s too hot where we live to grow them well. However, we’ve had moderate success growing currants and gooseberries in spots that get morning sun and shade from about noon on. Tastes like: Currants and gooseberries taste different from one another, but offer tangy, sweet, delicious fruit. 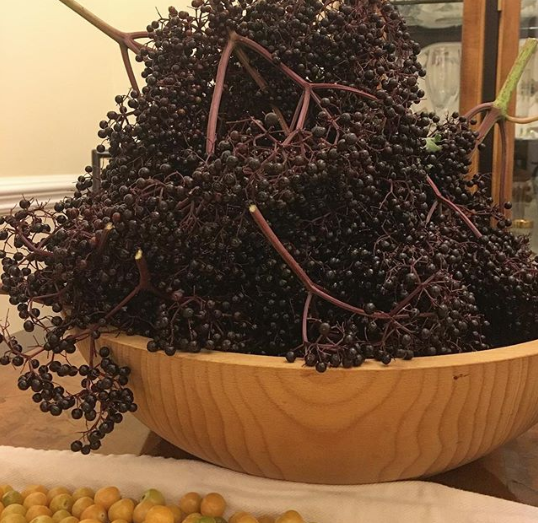 A summer night’s harvest of elderberries. Each elderberry plant produces a LOT of berries. Read about how to grow elderberries, make elderflower cordial, or make elderberry syrup. Shade tolerance: Tolerate part shade but don’t produce as much fruit as elderberry plants grown in full-sun. Tastes like: Elderberry flowers are a delicacy used as a flavoring in food and beverages. Raw elderberries don’t taste very good – like bland blackberries. However, when cooked the flavor of ripe elderberries transforms into an AMAZING blueberry-blackberry-red wine flavor. When to grow: Put elderberry starts in the ground in spring. Harvest flowers late spring and fruit in early-mid-summer. Elderberry plants grow vigorously from spring until dormancy at first freeze. Ripe pawpaw fruit at Tyrant Farms. 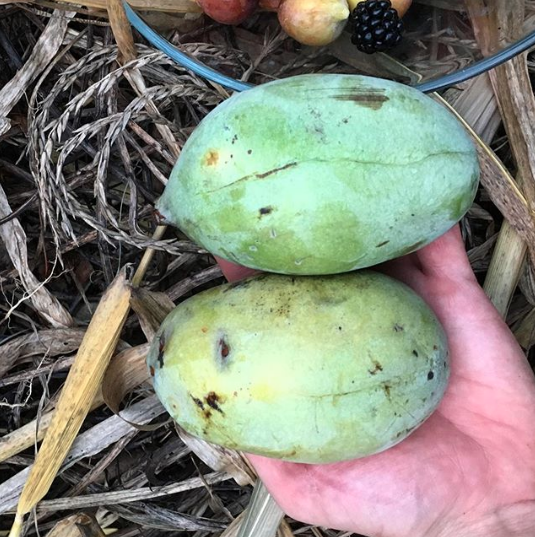 Read how to grow pawpaws, process & eat pawpaws, or make pawpaw sorbet. Shade tolerance: Pawpaws thrive as an understory tree for the first 3-5 years of their life. We have pawpaws growing in full shade that produce fruit, but their yields are lower than our full-sun pawpaw trees. Tastes like: Pawpaw fruit are delicious, with the flavor of mango-banana custard. When to grow: Plant pawpaw saplings in spring or fall. Flowers emerge in late winter-early spring, leaves slightly later; drop leaves in fall. Fruit harvested late-August – September. 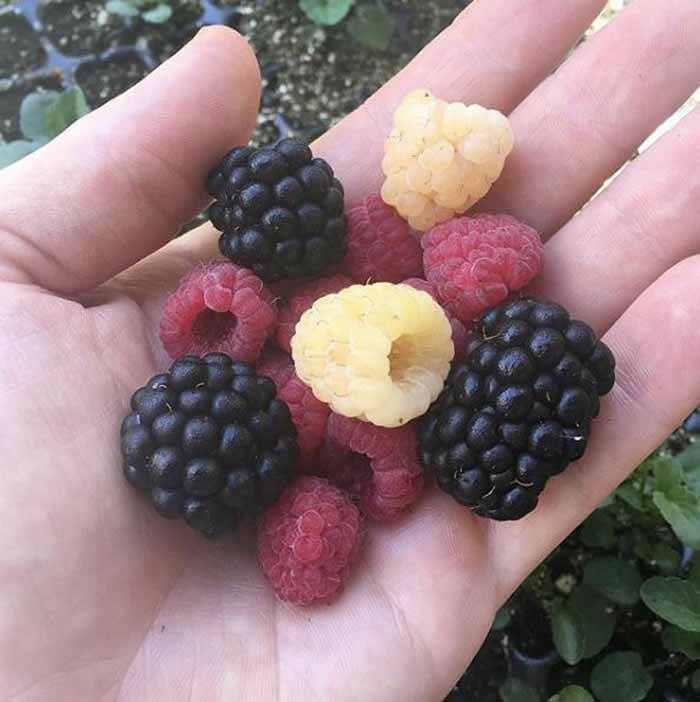 Red raspberries and yellow raspberries with large blackberries. Pretty much any cane berry will grow in part shade. Tastes like: Raspberry berries are tangy, sweet, and delicious. Raspberry leaves have a subtle berry-like flavor when made into tea as well. When to grow: Grow from starts in spring. Second year canes produce fruit. New canes emerge in spring, and three year old canes die and should be removed. Plants also spread aggressively via underground runners. Serviceberries are a delicious native fruit that taste like a cross between peaches and almonds, to which they’re related. Serviceberries are another fruit you can grow in part shade. Shade tolerance: Serviceberries grow well in part shade, but produces less fruit. Tastes like: Serviceberries taste like a combination of peaches and almonds – their relatives. When to grow: Transplant serviceberry saplings in spring after last frost. 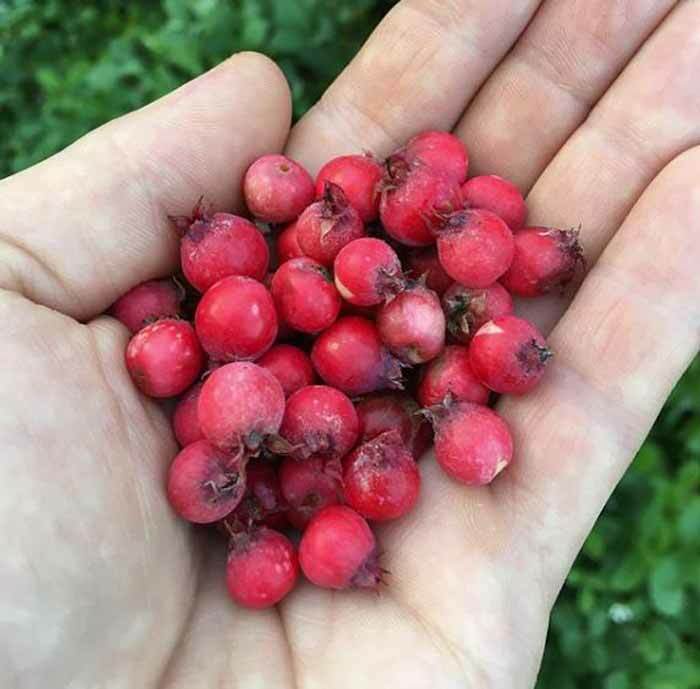 Pay attention to the varieties you get… We’ve grown serviceberries that reached 15′ tall and other dwarf varieties that only get to be about 3-4′ tall. Serviceberry fruit ripens in early summer around the same time as blueberries. Tastes like: As its alternate name implies, schisandra berries offer hints of all five flavors: bitter, salty, sour, spicy, and sweet. Very unique. When to grow: Put schisandra plants in the ground in the spring after last frost. Our schisandra plant is dormant throughout the cold months, and climbs vigorously up our north-facing back porch in the warm months. “Wild” refers to smaller-fruited strawberry varieties, many of which have had minimal or no breeding work done to them. Yellow wonder strawberries taste like tropical fruit punch and grow well in part shade. 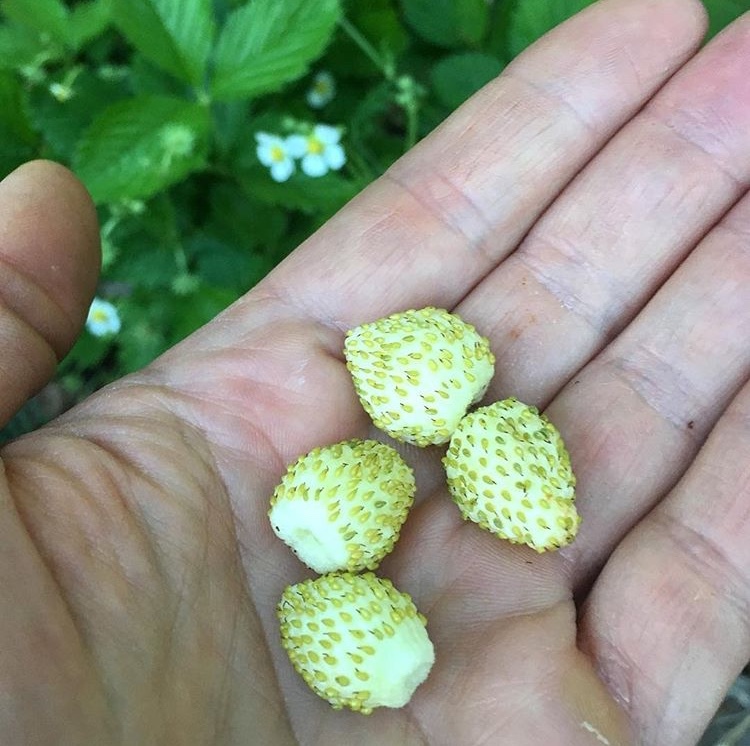 Our favorites are yellow wonder strawberries (which taste like tropical fruit punch) and our native red Fragaria virginiana (which taste like domesticated strawberries whose flavor has been turned up x10). Life cycle: Short-lived perennials, but most varieties produce runners that grow new plants. Shade tolerance: Understory plants that grow very well in part shade, especially if they get morning sun and shade in late afternoon. When to grow: Grow from starts or seeds, then transplant in early spring. Plants die down but keep some leaves throughout the winter in our climate zone (7b), then grow prolifically from spring through first freeze. Tastes like: Chervil offers a delightfully complex herbal flavor – mild notes of licorice and parsley (we love it chopped into scrambled duck eggs!). When to grow: Thrives in cool – mild weather and goes to bolt (produces flowers/seeds) as the weather warms. 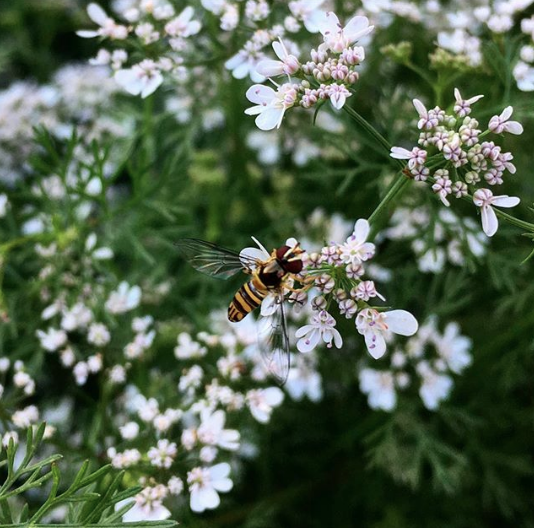 A syrphid fly pollinating cilantro flowers at Tyrant Farms. Cilantro grows very well in part shade. Tastes like: Cilantro is the pungent, funky, delicious flavoring often used in latino foods. When to grow: Even though it’s associated with summer foods, cilantro prefers cold-cool weather. In fact, it’s exceptionally cold-hardy. We’ve had cilantro survive down into single digits uncovered. Shade tolerance: Performs well in part shade, especially as weather warms (morning sun, afternoon shade are best). Tastes like: It’s hard to describe the unique taste of dill; forgive us for saying dill tastes like… dill. When to grow: Thrives in mild temps of spring and late summer-fall (doesn’t like too hot or too cold). Shade tolerance: Can grow in part shade – full sun. 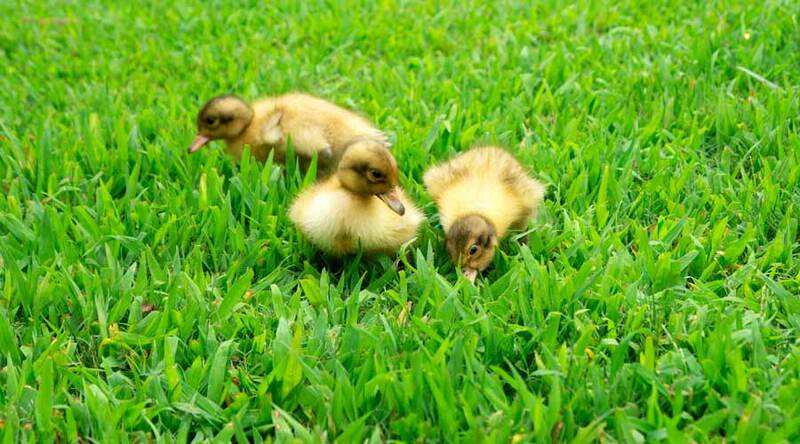 Requires very wet, boggy soil or even shallow water to grow well. Tastes like: Fish mint has a mild fish-like flavor and is used as an herb in lots of Asian dishes. When to grow: Transplant in spring after last frost and harvest frequently once plants are established. Warning: can be invasive when provided with ideal conditions. *French tarragon is a different plant than Russian tarragon (which isn’t nearly as flavorful) or Mexican tarragon (which requires full sun). Tastes like: French tarragon tastes similar to hyssop with a sweet, licorice-like flavor. When to grow: Transplant new French tarragon seedlings (can’t grow from seed) after last frost in spring. 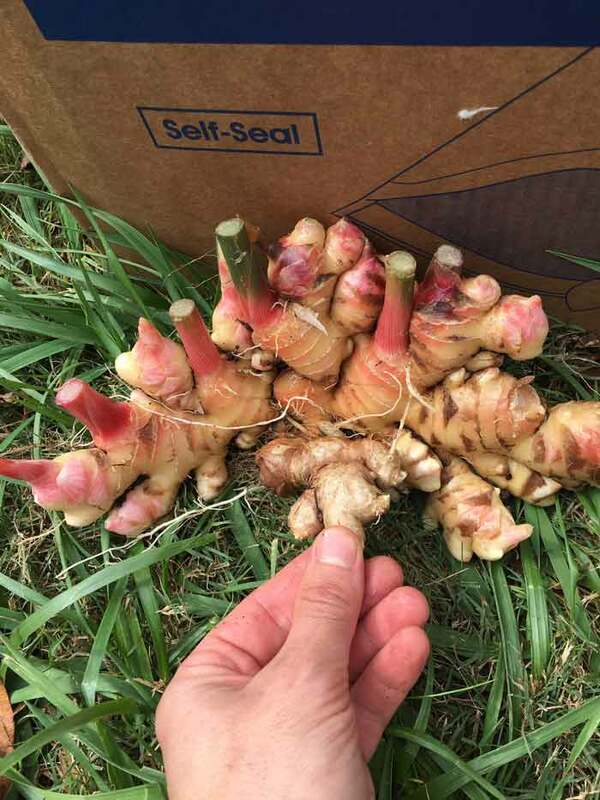 Freshly harvested baby ginger at Tyrant Farms. Read how to grow and use ginger. Life cycle: Ginger can be grown as a perennial or annual depending on your climate zone. Pull rhizomes after the plants die back in the fall/winter and replant after last frost date to grow as perennials in cooler climates. Shade tolerance: If grown in fertile moist (but not wet) soil, ginger roots thrive in full sun or part shade. In climates like Florida, ginger actually prefers some shade, especially in the afternoon. In cooler northern climates, ginger will produce larger rhizomes when provided full sun but will still produce smaller rhizomes in part shade. Tastes like: Ginger tastes spicy, earthy, and delicious. When to grow: From last frost through first frost. Start early indoors in cooler climates since plants need 9 months of growth to produce mature rhizomes; or grow tender “baby ginger” in as little as 4-6 months. Edible parts: Ginseng roots highly valued and used medicinally, especially in Asian countries. Tastes like: Ginseng is very bitter – it’s used for medicinal purposes, not for culinary use. When to grow: Harder to start from seed, ginseng is typically grown from transplanted first year roots, then harvested 3-5+ years later. Spearmint, peppermint, “mountain mint,” lemon balm, catnip, oregano, shisho, thyme, hyssop, and small-leafed basil varieties are all plants in the Lamiaceae family that we’ve successfully grown in part shade. Some are perennials and some are annuals. All provide amazing flavor and often have proven medicinal benefits. Warning: Many of these plants — especially mint and oregano — will spread like wildfire in your garden. It may be best to plant them in containers unless you want a LOT of them. Others — notably lemon balm and shisho — will readily reseed. Using thick mulch layers and/or pulling young unwanted seedlings in the spring can help control their spread. Shade tolerance: Lamiaceae plants easily tolerate part shade. Tastes like: Lovage tastes like a more intense version of its close relatives, parsley and celery. Unlike parsley and celery, lovage can grow huge, up to 6′ tall. When to grow: Start indoors 6-8 weeks before last frost and transplant out. Begin light harvesting after a few months; heavier harvests once plants mature. Shade tolerance: We’ve had parsley thrive in spots that get as little as three hours of direct sunlight in the summer. When to grow: Plant in spring and enjoy harvests well into the next year. Parsley is very cold-hardy. We’ve had it survive uncovered down into single digits. Rosemary grows best in full sun, but it will also grow in part shade spots under certain conditions. Ideally, the spot is full sun in the winter, even if it’s shaded in the summer. For instance, we have a large rosemary plant that only gets about 4-5 hours of direct sun in the summer months due to shade from tree leaves. However, all winter long it soaks up lots of sunshine on its evergreen leaves when our deciduous trees are dormant. There are many varieties of spicebush that grow natively throughout the world. The species that grows natively in our area (southeast US) is Lindera melissifolia, which is now endangered due to habitat destruction. Tastes like: Spicebush tastes similar to allspice – with notes of cinnamon and cloves. When to grow: Transplant saplings in spring after last frost. Berries ripen in late summer-fall. Edible parts: Roots are the most prized part of the wasabi plant, but the leaves, stems and flowers are also edible. Tastes like: Wasabi tastes similar to horseradish roots (most wasabi you’ve had with sushi was actually made from horseradish roots, not the wasabi plant). Alliums are a huge and diverse genus that include garlic, onions, chives, ramps, and other beloved edibles. All alliums that we know of can can grow fairly well in part shade. Keep in mind that alliums grown for their large bulbs (such as onions, garlic, and elephant garlic) won’t form very large bulbs in shaded spots. However, they will still provide plenty of delicious allium greens. Tender young “green garlic” (immature garlic). You can also just harvest the leaves and let the bulbs stay in the ground so the plants continue to grow and produce more garlic bulbs, eventually forming large colonies. As an example, we have multiple garlic patches growing in part shade spots that we treat as perennials, even though garlic is typically grown as an annual. We harvest the garlic leaves (and sometimes the bulbs too on larger colonies) to use as “green garlic” during late winter and spring. 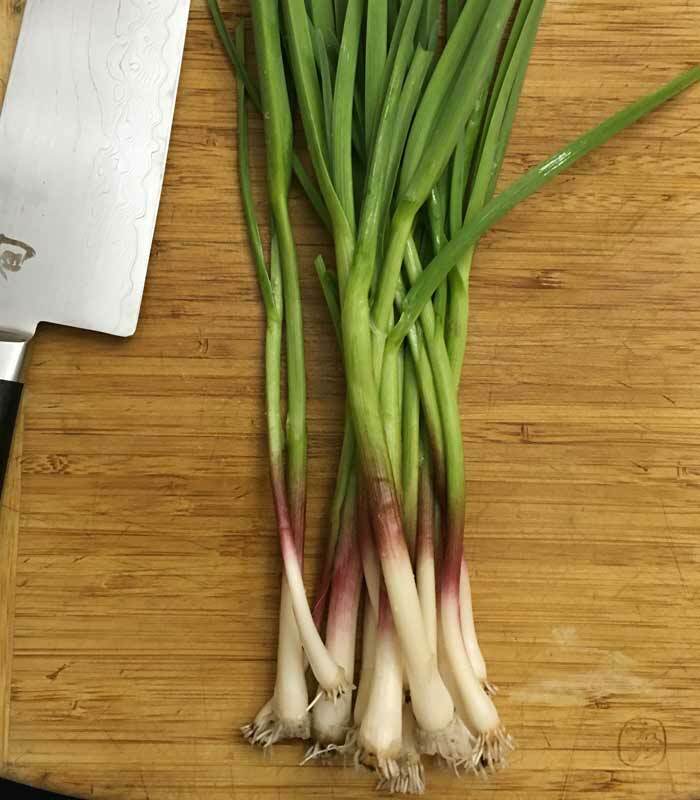 Each year, the garlic colony’s bulbs divide and produce more and more garlic greens. Chives and bunching onions can be grown similarly in part shade spots, forming dense patches. Artichokes and cardoons are closely related plants that are essentially giant thistles. 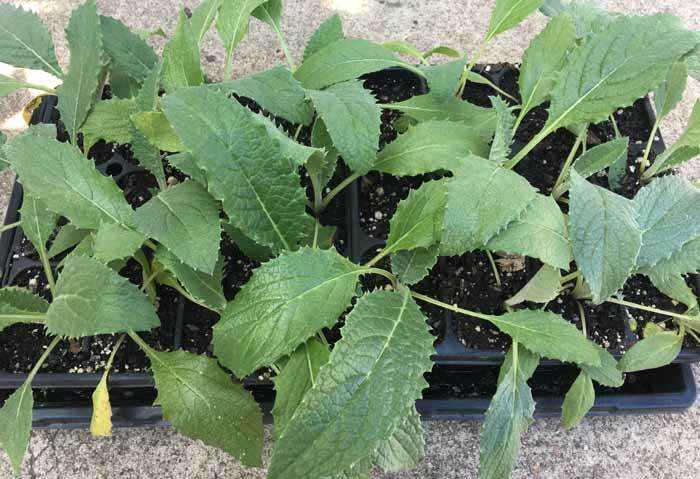 Artichoke seedlings ready to be transplanted in the ground. Artichokes are bred for their huge edible flower heads (which are picked young before seed formation), whereas cardoons are bred for their edible stems (which taste exactly like artichokes). Shade tolerance: Both plants will grow well in part shade. Tastes like: Artichokes and cardoons are two of the best tasting veggies out there, in our opinion. Sweet, earthy, creamy, umami. When to grow: Transplant seedlings after last frost. Some artichoke varieties produce flower heads during their first growing season, others take 1 year. Same with cardoons. Shade tolerance: Does well in part shade, especially in the warm months (this is another plant that we grow underneath tall annual plants in the summer (corn, tomatoes, etc). Tastes like: Bucks horn plantain leaves have a strong, leafy green flavor (like spinach x10); the seed heads have a mushroom-like flavor. When to grow: Start from seed in late winter and transplant outdoors after last frost. Our bucks horn compacts down but stays green throughout winter, then puts on lots of growth throughout the warm months before seeding in summer. A lush patch of chickweed growing at Tyrant Farms. 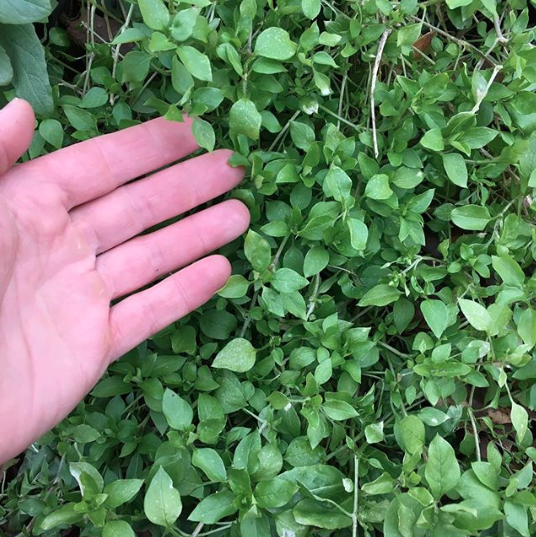 Read about how to grow and use chickweed. Tastes like: Chickweed leaves taste like corn silk (sweet and earthy). When to grow: Chances are, you’re already unintentionally growing chickweed as a “weed” in your yard. It thrives in cool weather, growing in our area from fall until the weather warms up in spring. 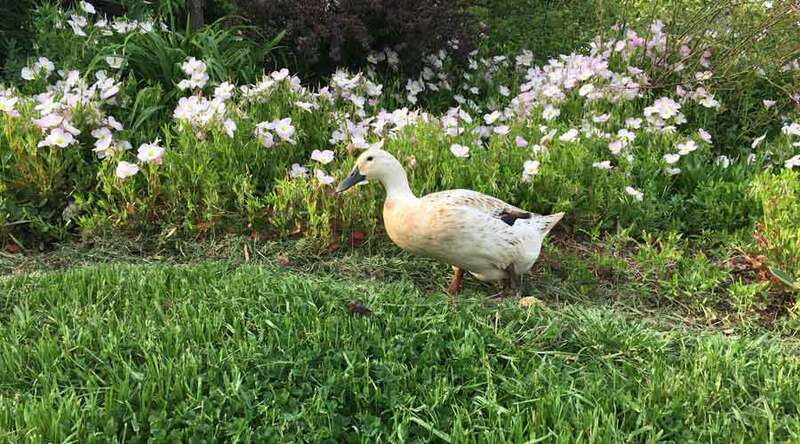 By mid-late April, each chickweed plant has produced thousands of seeds and died, but not before we’ve eaten piles of it and fed giant amounts of it to our ducks as well. Daylilies are another common garden plant that’s edible and also tolerates part shade very well. There are so many modern hybrids that it’s impossible to say with 100% certainty that EVERY daylily variety is edible, but all the older varieties are. What looks like a fingerling potato, tastes like a fingerling potato, but isn’t a fingerling potato? Daylily tubers, which can be grown in part shade. Wild orange-flowering daylilies grow abundantly in our area in the spring along roadsides and old homesteads. That was the variety originally brought over by European immigrants as a food crop. 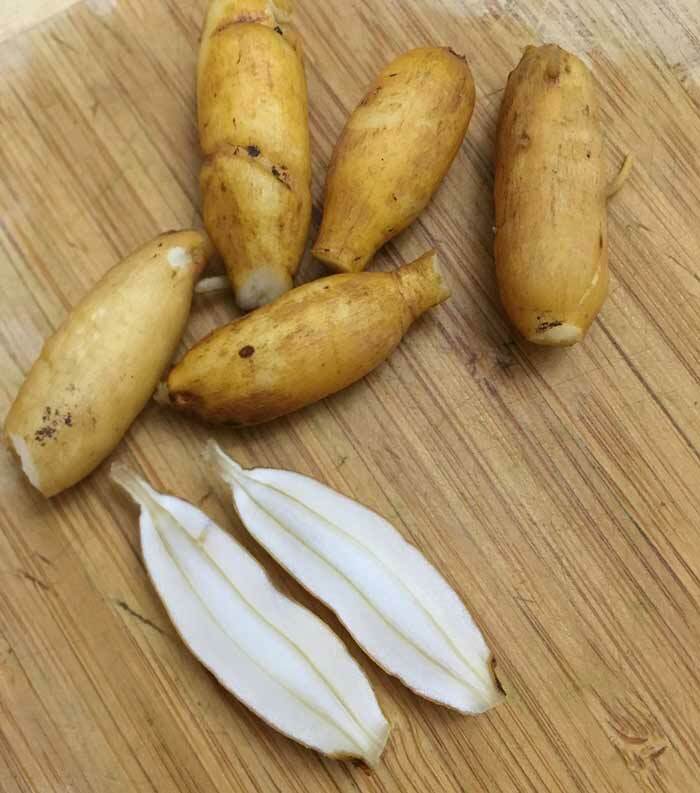 Tastes like: Daylily tubers look and taste surprisingly like fingerling potatoes. The young leaves/shoots taste like a cross between sweet lettuce with subtle hints of onion. The flower buds and flowers are delicious – sweet and nectary with a soft velvety texture. When to grow: Plant tubers in the spring and allow to mature for one year before harvesting parts of the plant. Tubers are best after the plant goes dormant in the fall or before the plant breaks dormancy in the spring. New leaves/shoots are harvested in late winter-early spring; flowers in the late spring-summer. Tastes like: False Solomon’s seal shoots taste similar to asparagus, its relative. When to grow: Plant roots in spring, harvest shoots once plants are established after 2 years. Warning: There are multiple edible varieties of ferns, and there are multiple inedible/poisonous varieties. The variety that we grow is Ostrich fern (Matteuccia struthiopteris). Ostrich fern fiddleheads ready for harvest. These plants can grow in full shade. Don’t ever eat a fiddlehead from a fern unless you’re 100% certain you’ve correctly ID’d the species. Tastes like: Fiddleheads taste like a cross between asparagus and spinach. When to grow: Transplant young plants in the spring after last frost. Leave the plants to mature for 3 years before you begin to harvest its fiddles, which emerge in spring. 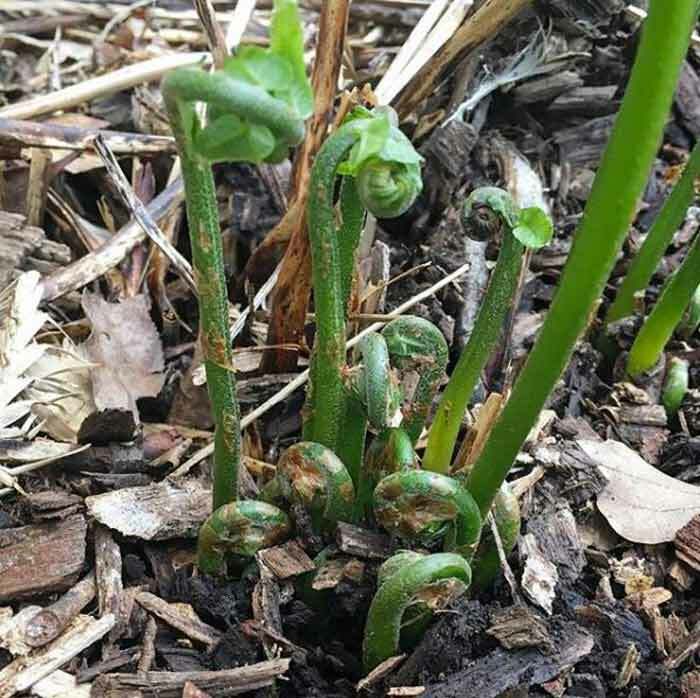 Never harvest more than 50% of the fiddleheads from a fern crown in any given year in order to ensure that the ferns stays vigorous for years to come. There are LOTS of edible flowers that grow in part or even full shade. 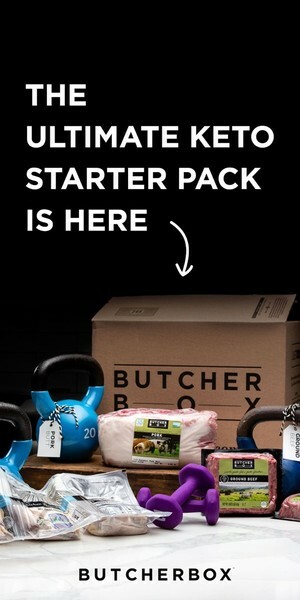 Some are listed separately in this article. Left to right: calendula, nasturtium, and dianthus flowers, all of which are edible and can grow in part shade. For the sake of brevity, we’re lumping a few others together. 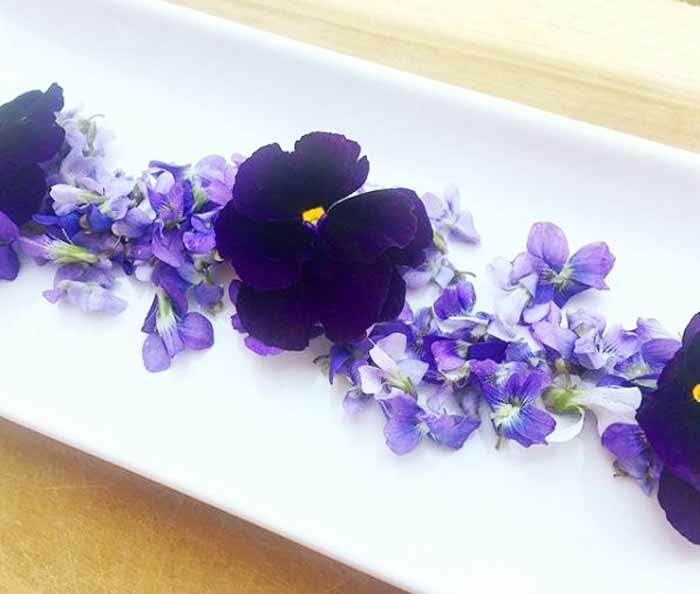 If you want a far more thorough list of edible flowers, check out Thompson & Morgan’s edible flower list. Yes, this common yet beautiful garden plant is edible! In fact, hostas are a common veggie in many Asian countries. 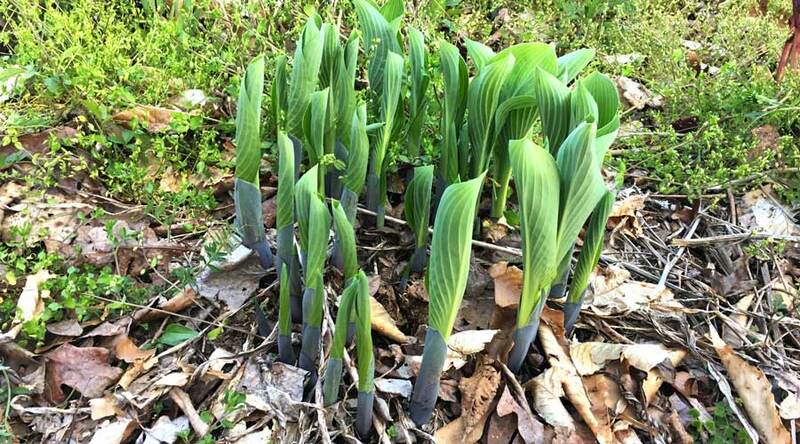 Hosta shoots – these are actually a little older than you want to pick them. At this stage, they’re starting to get a little bitter. There are dozens of hosta cultivars, and all are edible. Some may taste better than others, since many modern cultivars are bred purely for looks, not flavor. Tastes like: Young hosta shoots taste similar to asparagus (it’s an Asparagaceae, the same plant family as asparagus); older shoots taste more bitter as leaves develop. 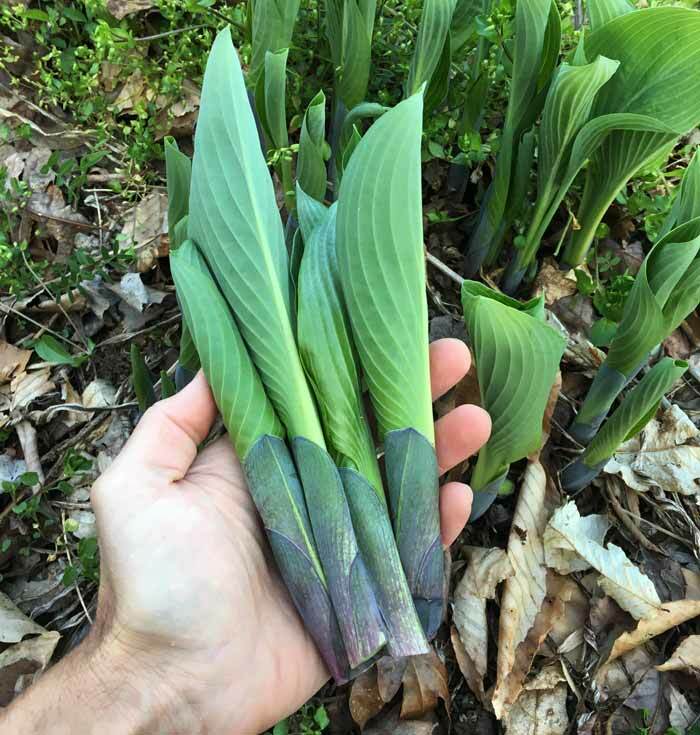 When to grow: Plant hosta crowns in early spring. They’ll live for many years and grow vigorously from spring through first frost. 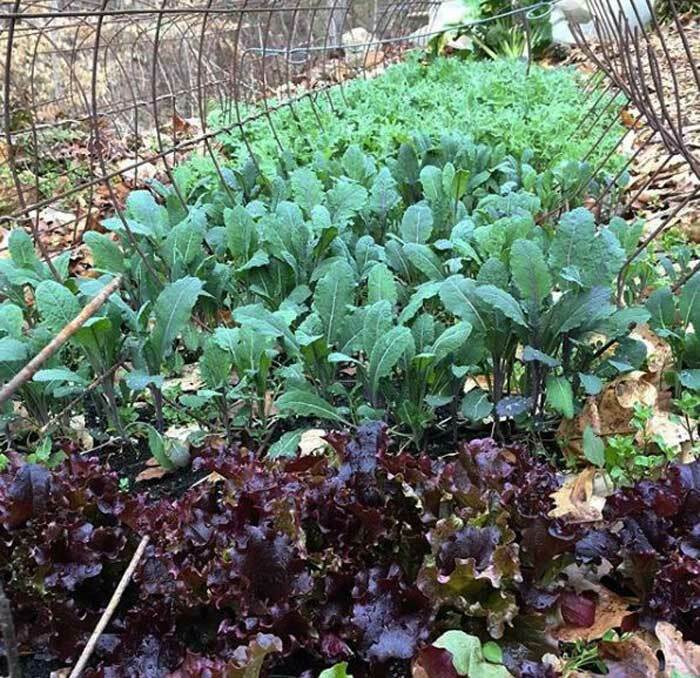 Arugula, bok choy, chard, chicory, cress, fenugreek, kale, lettuce, mâche, mustard, spinach, sorrel… nearly every leafy green you can think of will grow well in part shade – especially as the weather warms up. 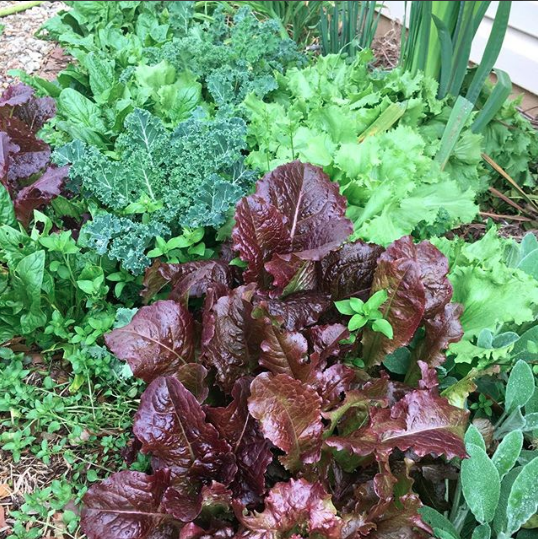 Red lettuce, kale, chicory, spinach, and more growing in a shady garden bed at Tyrant Farms. Most any leafy green veggie you can think of will tolerate part shade. Leafy greens also grow better in morning sun and afternoon shade, rather than the other way around. Peas grow perfectly well in part shade, especially as the weather warms. Shade tolerance: Peas thrive in cool weather (40s-upper 60s) and quickly die out once temps start to rise into the 80s. 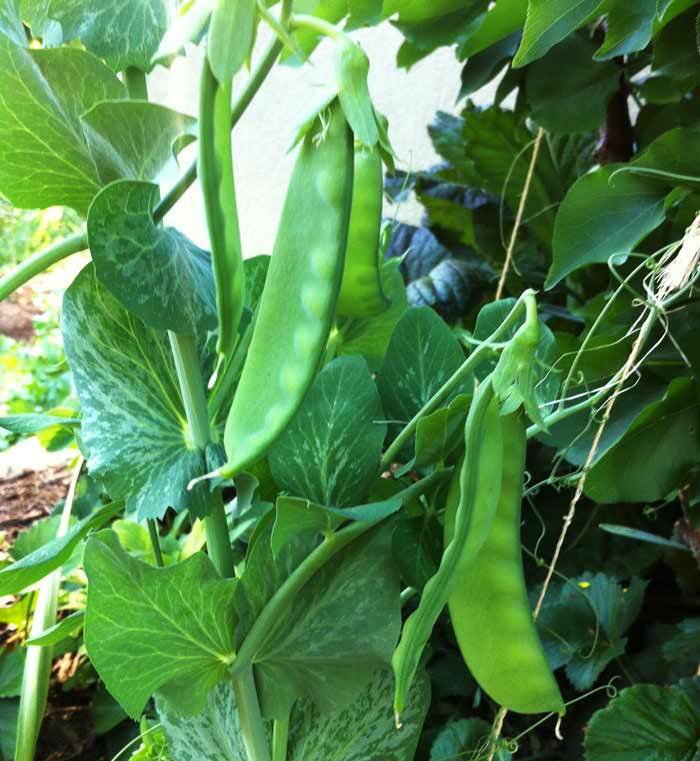 We plant peas in various spots around our garden, from full sun – part shade. The plants that receive more shade last longer in warm weather, even if they don’t set quite as many pods. Tastes like: Everyone knows what pea pods taste like, but other parts of the plant are equally delicious. The growth tips/leaves of pea plants taste very similar to sugar snap peas (a particularly cold-hardy variety that we love for greens is Austrian winter peas). Pea flowers are also sweet with the texture of velvety lettuce. Shade tolerance: Tolerates part shade in the north. In warmer areas like where we live, the only way to grow rhubarb is by putting it in spots where it gets shade throughout the hot parts of the day. Tastes like: Tangy, sweet-sour. Strawberry-rhubarb pie is one of the best discoveries in human history. When to grow: Transplant young rhubarb plants in spring after last frost. Harvest stems sparingly from younger plants in the spring – summer and more aggressively from 4+ year old plants. 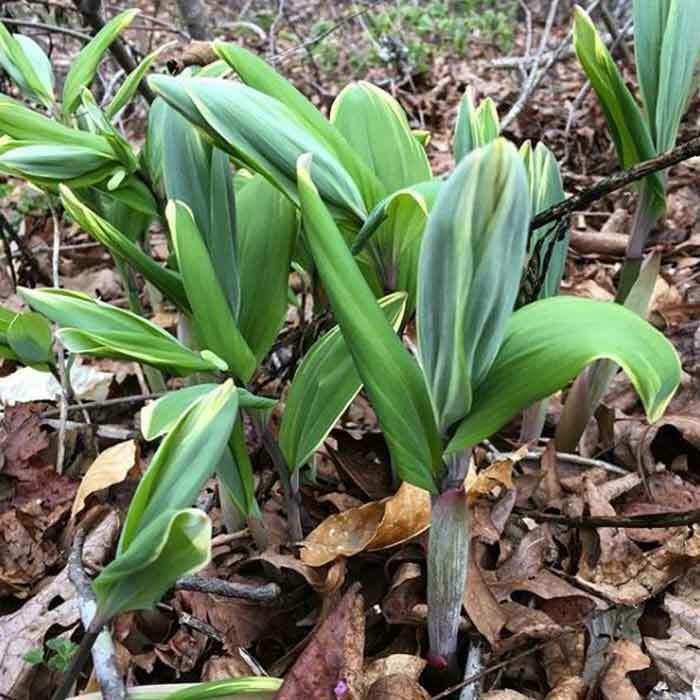 Solomon’s seal shoots – a little past ideal harvesting stage but still good. This unique vegetable can grow in part shade to full shade. Shade tolerance: part shade – full shade; ours grows in a forest area underneath a fully-shaded tree canopy. Tastes like: Solomon’s seal’s young shoots taste like asparagus, its close relative. When to grow: grow from starts in the spring; plants break dormancy as soon as ground thaws and die back at first freeze. A basket of stinging nettle at Tyrant Farms. Read how and why to grow stinging nettle. Shade tolerance: we have patches of stinging nettle growing in full sun, part shade, and full shade; all are thriving. Tastes like: Stinging nettle offers a pleasant, mild cucumber and earthy umami flavor. When to grow: Grow stinging nettle from seeds or starts in spring; plants break dormancy as soon as ground thaws and die back at first freeze. You can grow tomatoes outside of full sun spots? Yes, we’ve grown tomatoes in surprisingly shady spots in our garden. The key is to select small-fruited varieties that don’t require nearly as much photosynthesis to mature. We get piles of yellow currant and Matt’s Wild Cherry tomatoes from our part shade-grown plants. 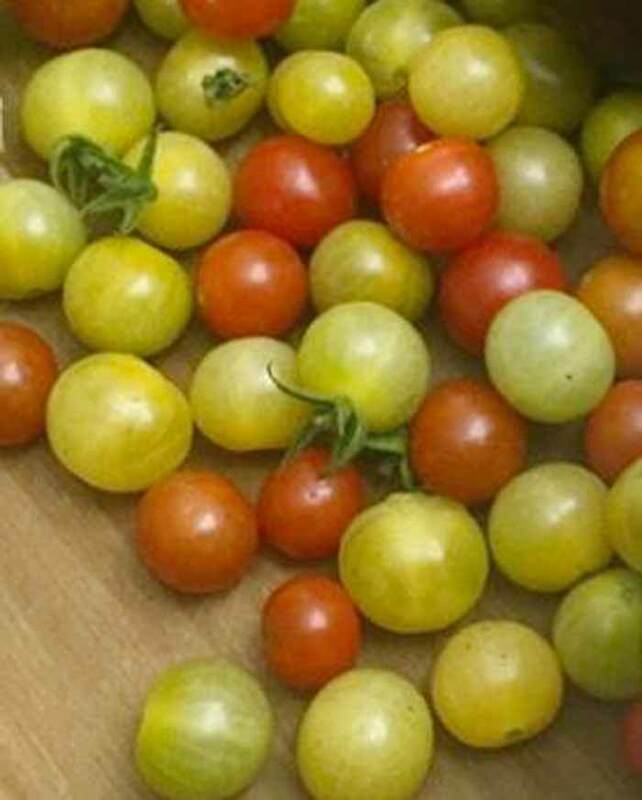 Our favorite type of tomatoes to grow in part shade are yellow currant varieties, although small red tomatoes like Matt’s Wild Cherry tomatoes will also perform well in part shade. Tastes like: We shouldn’t have to tell you what a tomato tastes like! Tastes like: Trandescantia stems taste like a cross between asparagus and lettuce. They get tougher, more fibrous, and more mucilaginous with age, so eat them when younger. Tender young leaves offer a similar flavor and are good in mixed green salad. 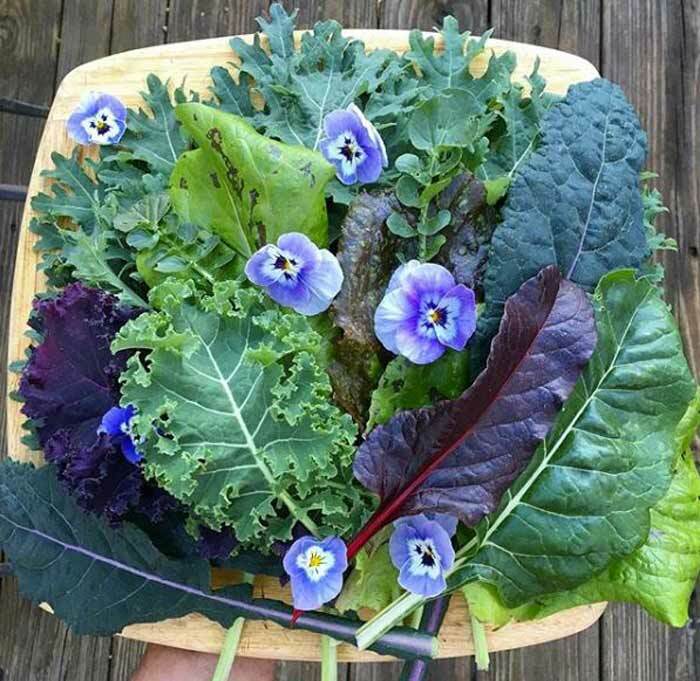 Gorgeous blue flowers are swarmed on by bees, but make a nice colorful addition to salads or good as a garnish. Seeds are slightly bitter and were used medicinally by Native Americans. When to grow: Recommend growing from starts transplanted outdoors in spring. Harvest stems and leaves in spring as the plant is breaking dormancy. Flowers in late spring-early summer. Closely related purple pansies and violas. Both plants produce edible flowers and leaves, and both can grow in part to full shade, although they also do well in full sun during the winter. Yes, these beautiful cold weather flowering plants are edible too. Pansies are simply larger, bred varieties of violas. Tastes like: Viola and pansy flowers offer a sweet, sublimely subtle wintergreen/mint flavor. The leaves taste like lettuce. As you now know, having a shaded yard or garden bed doesn’t mean you can’t grow edible plants there. There is a huge variety of delicious fruit, herbs, and vegetables that grow in shade, so plan to start your shade garden today. The hardest part is narrowing down the choices of shade-loving edible plants to what you can conceivably stuff into your garden! Oh, one last thing: if you have a full shade garden, that’s ideal for growing gourmet, medicinal mushrooms! Here’s how to start your own mushroom garden. 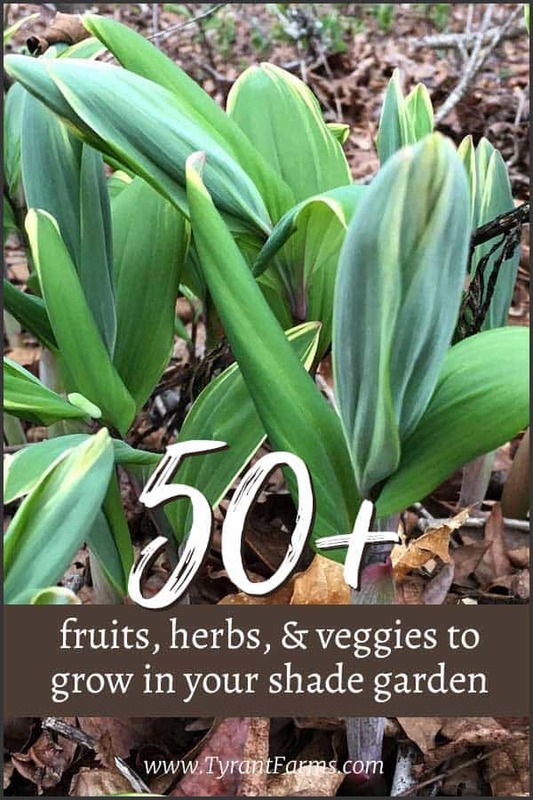 If you enjoyed this article about fruits, herbs, and veggies that will grow well in your shade garden, please share it on Pinterest! 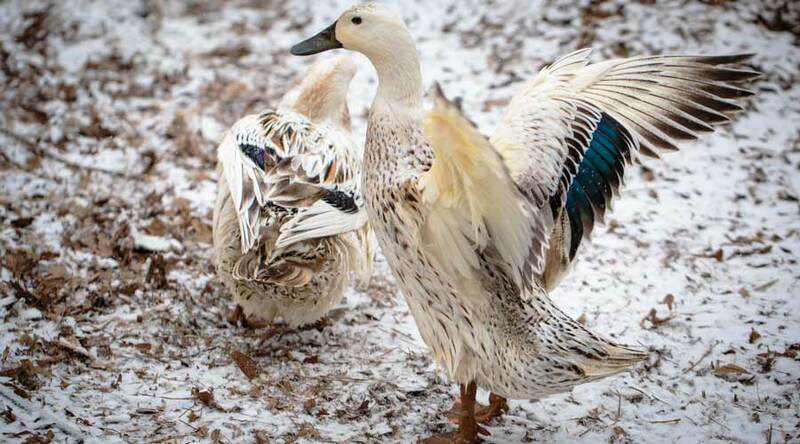 Organic gardener, plant geek, and heritage breed duck mom. Susan earned a B.A. in Biology from College of Charleston, worked as an ACSM certified personal trainer, and as a research assistant in addiction psychiatry at Medical University of South Carolina (MUSC). She puts her strong technical research background to work for Tyrant Farms (on the blog and in the gardens). 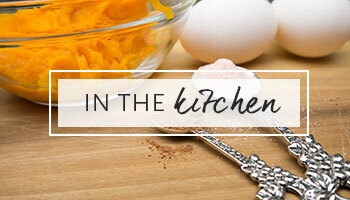 Foraging, cooking, fermentation, and mixology round out her other interests. 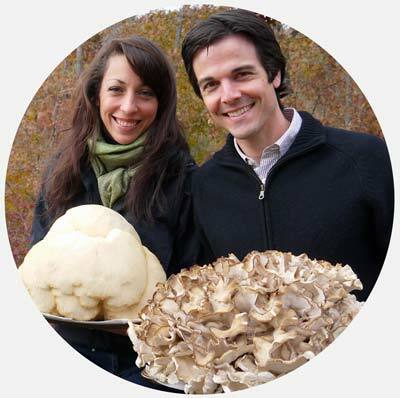 In addition to their collaboration on Tyrant Farms, Susan and her husband Aaron are cofounders of GrowJourney.com, a USDA certified organic seed & gardening education company.